Dry-fry the bacon for 1-2 minutes in a heavy-based frying pan until crisp. Drain on kitchen paper. Pile the salad on the base of a serving dish. 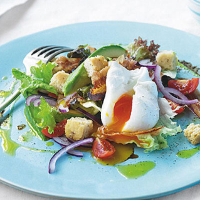 Scatter with the tomatoes, avocado, onion and croutons. Drizzle the dressing over the salad, and scatter the cooked bacon on top. Heat a pan of water with the white wine vinegar. Slide in the egg and simmer very gently for 3 minutes, until just set. Remove from the pan with a slotted spoon and place gently on top of the salad. Season the egg and serve.